Cameroon's sports minister hopes to have drawn a line over last year's strike by agreeing new bonuses with senior members of the national squad. Adoum Garoua met with Alex Song, Enoh Eyong, Carlos Kameni and Nicolas Nkoulou in France on Wednesday. The meeting was convened to avoid a repeat of last year's strike by players in a row over money. In the French city Metz, bonuses for both Africa Cup of Nations and World Cup matches were drawn up. Players will now be paid participation fees of nearly US$1,000 for every Nations Cup, with a drawn game delivering a US$3,835 bonus and a win some US$7,670. World Cup participation fees are the same, with group stage wins earning the players US$9,600 per man and US$4,800 for a draw. The bonuses increase in the knock-out stage, with Indomitable Lions players set to earn US$11,500 for a win. Even though the match fees for the actual tournament themselves were worked out, the players chose not to determine bonuses for qualifying campaigns. Sports Minister Garoua praised the sense of maturity and responsibility shown by the players and said that communication and security around the Indomitable Lions would improve. He also urged Cameroon's Football Federation (Fecafoot) to be transparent - and share information - about the funds raised through sponsors and friendly matches. The meeting in Metz had originally been set for 8 May, but was postponed. The government had been keen to address the problems which led to last year's strike and significant bans for Eyong and national captain Samuel Eto'o. Eto'o is still excluded from the squad but Eyong has been recalled and was invited to talk to the minister. "The team is undergoing reconstruction and there is a need for dialogue and partnership," Adoum Garoua said before flying to France. "[The meeting will] be a working session to improve the working conditions and the performances of the players." 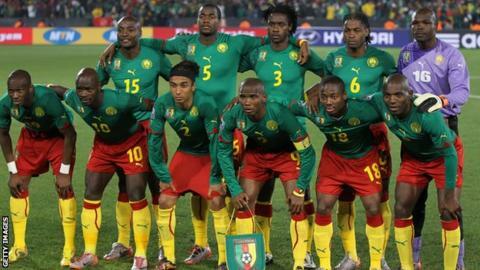 Cameroon face 2014 World Cup qualifiers against DR Congo and Libya next month, followed by the second leg of their 2013 Africa Cup of Nations tie against Guinea-Bissau, which they lead 1-0 from the first leg.